Our own Burt Malkiel talks with CNBC’s Maria Bartiromo about investor confidence, the bond market, and why Rebalance’s low fees and index funds make so much sense. Maria Bartiromo: Joining me right now is Burton Malkiel. He is author of the investing guide A Random Walk Down Wall Street, Princeton University professor, and member of the investing committee of Rebalance. Burt, good to have you on the program. Burton Malkiel: Thank you very much. Bartiromo: Thank you so much for joining us. And in terms of investing today, you’ve seen a huge outflow of money coming out of bond funds. What would be an appropriate way to look at one’s retirement, look at your IRA, in terms of allocating bonds versus stocks? Malkiel: Well I’m actually rather worried about the bond market. I think people should remember history. The last time U.S. government bond yields were as low as they are today was at the end of World War II, because we pegged interest rates very low to finance the large government deficit. Rates stayed low into the early 1950s and then started rising steadily till 1980. As those interest rates rose, bond prices fell, bonds became very, very volatile, and those who don’t remember history I think are doomed to repeat it. We’re in the same situation now. We’re financing our large debt with what’s called financial repression, keeping interest rates very, very low. As interest rates normalize, this is not going to be a good place for the bond investor. Bartiromo: Tell me what you’re trying to do from your new position on the board of Rebalance. Malkiel: Well, basically the problem is this. You’ve got a number of financial advisors who are putting portfolios together for people, and there are two problems with many of them. First of all, they tend to be conflicted. They will want to put things in your portfolio where they get a commission. And secondly, they might charge you one, two, or three percent a year to look over your portfolio. With Rebalance, we charge a very low overall fee, and we use my favorite funds, index funds, which charge rock bottom expenses. Malkiel: Like ETFs, that charge almost nothing to get into a broad-based equity market. Bartiromo: Do you think the average American is saving enough for retirement? Malkiel: Absolutely not. I think this is one of the crises that we have in this country. 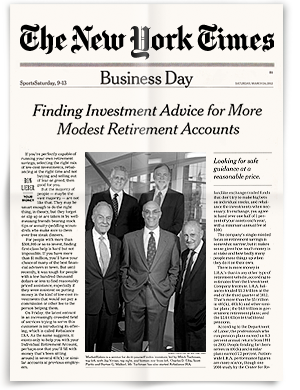 Malkiel: The average size of an IRA is somewhere just over $50,000. We need much more. We really need to have a campaign to get Americans to save more. Bartiromo: Burt, good to have you on the program. Malkiel: Thank you very much, Maria, my pleasure.